Videos, worksheets, examples and solutions to help Algebra 1 students learn how to solve systems of linear equations with fractions. How to solve systems of equations with fractions? Step 1. Eliminate the fractions by multiplying each side of the equation by a common denominator. Step 2: Solve the resulting system using the addition method, elimination method, or the substitution method. 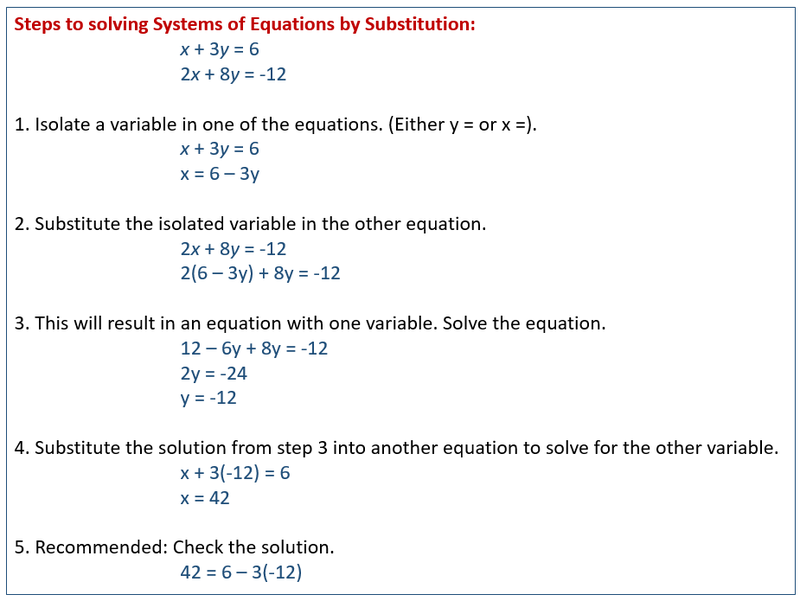 The following diagrams show how to solve systems of equations using the Substitution Method and the Elimination Method. Students learn to solve systems of linear equations that involve fractions. Students also learn to solve linear systems of equations by the method of their choice using the following rules: if one of the variables cancels out when the equations are added together, then use addition, and if a variable is already isolated in one of the equations, then use substitution. How to solve a system of 2 equations with 2 variables involving fractions using substitution? How to solve a linear system by the process of elimination where the equations contain fractions? 1. Scale the system so that integer coefficients exist. 2. Use elimination to solve for the solutions, if they exist. Solve a system of linear equations using multiplication with addition or subtraction.